Sister Marguerite McHugh (left) with Kelly Knox. One thing I have learned in 45 years of reporting and writing is very basic, very simple and very much a part of the journalism I do. Treasure the people you meet along the way, especially the so-called "regular people," the people who are neither famous nor wealthy. Because the fact is, there is nothing regular about them. There is always – always – something special about them. They go about quietly and do good; they serve their fellow humans clinging to this Earth, this piece of star dust, hanging in an obscure corner of a vast universe. They do it because their hearts are good. One of them whom I will never forget is Sister Marguerite McHugh of the Sisters of Notre Dame de Namur. Early in her adulthood, she served her country in a Navy uniform; later, she served humanity and her God as a teacher, a mentor to others and, in her later years, as a woman who volunteered at Good Samaritan Hospital rocking newborn babies with a loving touch. She passed away in 2016 at the age of 93, after 62 years leading the religious life with the Sisters of Notre Dame de Namur. I met her in 2009 when she was the matriarch and chaplain of American Legion Post 644, a post for women veterans which was founded in 1946. In the years after World War II, there were 10 such posts in Ohio. Today, it is the only one left in the state. There are only about six nationwide. She had spent many years as the post commander, at a time when it was made up entirely of World War II and Korean War-era veterans. The post nearly died out about 10 years ago. Sister Marguerite and her generation of World War II veterans were aging and could no longer bear the burden of running the post. Young women veterans like Darleen Adkins and Kelly Knox stepped in to fill the breech, and revived the post by recruiting women who had served in Desert Storm, Iraq and Afghanistan. 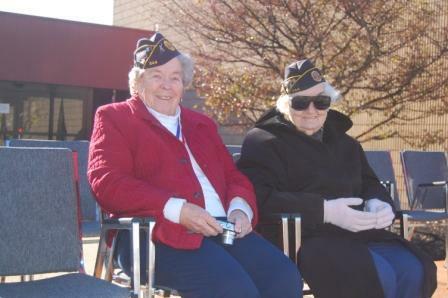 Sister Marguerite (right) with Lynn Ashley as Co-Grand Marshals of the 2010 Hamilton County Veterans Day parade. Knox, an Air Force veteran of Desert Storm and Bosnia, said the young veterans know they are standing on the backs of women like Sister Marguerite and the late Lynn Ashley. "Women like Sister Marguerite got a lot of push-back from the men who were the powers in the American Legion,'' Knox said. "Sister Marguerite came across to people as being quiet and compliant, but she was no push-over. "She didn't want to hurt anybody, but she stood her ground and pushed back,'' said Knox, an expert in post-traumatic stress disorder at the Cincinnati VA Medical Center. So how did this diminutive, thoughtful and nurturing nun become a military veteran and the spiritual leader of an American Legion for women veterans? It's a tale worth welling. In 2009, I went with Kelly Knox to the Health Center at Mount Notre Dame, a retirement and health care home for retired nuns. The three of us sat around a beautiful oaken table in deep, plush chairs, as Sister Marguerite spread out scrapbooks and newspaper clippings that told the story of her life. It was a life that began in 1922 in the Church of the Nativity parish in Pleasant Ridge, not far away from Mount Notre Dame in Reading where her religious service would eventually begin and end. She was named Mary Catherine at birth, and was the eldest of John and Marguerite McHugh's six children. When she was very young, her aunt, Sister Sarah Marie, lived at Mount Notre Dame. Mary Catherine was placed in the boarding school at Mount Notre Dame when she turned five. "All I ever did was cry,'' she remembered. "There was a Sister Lucy who would rock me for hours." She was still crying when her parents came to take her home. It was a childhood memory that led her many decades later to her volunteer work at Good Samaritan Hospital, rocking newborn babies in her arms. Young Mary Catherine was musically inclined and had a lovely singing voice. She told me that she actually considered going to New York to try out for the Metropolitan Opera. But instead, she ended up dropping out of school and became a beautician. Then, Pearl Harbor was bombed by the Japanese and the U.S. was thrust into World War II in both the Atlantic and Pacific theaters. "I had two brothers in the military and I felt like I ought to be doing something to win this war too,'' Sister Marguerite said. "I thought maybe we'd win the war faster if I got in." She said that with a little grin on her face, but, to this day, I believe she wasn't entirely joking. Mary Catherine joined the WAVES, the women's branch of the U.S. Navy Reserves. Women were not allowed in combat, but thousands of them served stateside to do jobs that freed up men for combat roles overseas. In Mary Catherine's case, in April 1944, she boarded a train at Union Terminal bound for Hunter College in the Bronx, N.Y., where thousands of women were sent for their military training. From there, she was sent to Norfolk, Va., for basic training. After basic training, she spent a period of time where she did nothing but mop floors. Then, she was taught to be a trainer. At the U.S. Naval Station in Norfolk, she trained countless Marines and sailors how to fire the big anti-aircraft gun on the ships. A lot of her all-male students looked askance at being ordered about by a woman. A tiny woman, at that. "There were a whole lot of them who had a time listening to me at first,'' she said. "Then they would go out into battle and lose some men. When they came back, they were willing to pay a little more attention." Mary Catherine's two-year stint in the Navy ended in 1946, nearly a year after the end of the war. She came back home to take up being a beautician again. For a while, she worked as a long-distance phone operator. Then, the seeds of her religious life were sewn. She was active in the Catholic War Veterans Association and became a Third Order Franciscan, where she volunteered to serve people in need. In a visit to Mount Notre Dame, her aunt, Sister Sarah Marie, asked her if she would be joining the Sisters of Notre Dame. "That opened my eyes,'' Sister Marguerite told me. "That's when I knew it was time to respond to God's call to religious life." At the age of 33, she entered the Sisters of Notre Dame de Namur and became known as Sister Marguerite Michael. In her years as a nun, she taught in Chicago, Phoenix, Dayton, Oh., Hamilton and Columbus before coming back for several assignments in the Cincinnati area. Always, she was committed to helping the poor. Social justice issues were at the center of her work. She worked with Catholic Social Services and the St. Vincent de Paul Society to work with the poor, and helped inmates at the Hamilton County Justice Center earn their GEDs. In 2012, she was inducted into the Ohio Veterans Hall of Fame. 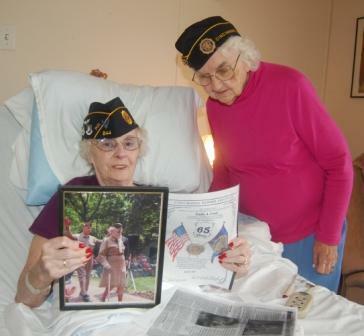 Sister Marguerite (right) visits Past Commander Emily Clark in the nursing home and delivers her 65-year membership patch. "To me, it was a natural progression that I become involved in veterans' issues, particularly women's veterans,'' Sister Marguerite said. "And so here I am. I am happy. I have had a good life." We talked a while longer and Sister Marguerite asked me if I had seen the chapel, named after St. Julie, who founded the Sisters of Notre Dame de Namur. I said I had not. So she walked me down a long hallway to the other end of the complex, along with Kelly Knox. We swung open the heavy wooden doors and my jaw nearly hit the floor when I looked inside. The chapel was one of the most beautiful sites I have ever seen – certainly more beautiful than any other religious venue I had seen. Sister pointed out interesting features of the architecture and the statues that lined the walls, along with the Stations of the Cross. Then she turned to me and smiled. "You know, Howard,'' she said, "I'd be happy to leave you alone here for a while if you would like to pray." I have to admit I was somewhat taken aback. The only other time I had an interview subject ask me to pray was Billy Graham, many years before in a Cincinnati hotel room. Sister looked up at me with that beatific smile. Saying no to her was not an option. "Thank you, Sister,'' I said. "Perhaps I will, just for a few minutes." "That's fine,'' she said. "We'll be right outside." And the heavy doors closed, leaving me alone in that breathtaking chapel. Quite a place for a Methodist boy to find himself. I knelt on a prayer bench. I had only one request of the Almighty. Lord, I said, send us more Sister Marguerites. We need them. I was only 22 years old in January of 1975, a reporter for The Post, the student newspaper at Ohio University in Athens. There has never been a relationship in the history of Ohio politics like the often-prickly, always competitive one of John H. Glenn Jr. and Howard Metzenbaum. Two men linked forever in the history of Ohio politics.